This year’s San Diego Comic Con is right around the corner. In fact, preview night begins this Wednesday, the 19th, and then runs through Sunday. 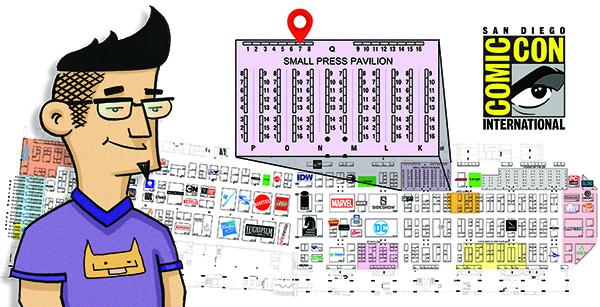 It’s the biggest comic convention in the world, dwarfing all other show’s in attendance and scope of creators, talent and industry professionals. Last year, on a whim, I applied for a table, for this year’s San Diego Comic Con. And a few months later, I received a nondescript letter in the mail with the familair SDCC eye logo (which is coincidentally drawn and designed by my all time favorite, and probably most influential comic book artist on mine) which stated that after careful review by a panel of judges, I had been chosen for this years, 2017, San Diego Comic Con. I was beyond excited. I told, only a handful of friends and family, and have been working in secret prepping for the show, planning on making this show the biggest, and most exciting Peanizles splash ever. I have new merchandise available, that I’ll be showcasing at San Diego Comic Con, and highlighting here on my website. I have a brand new book, the very first in a series of children’s books, starring Chuck and the whole Peanizles gang, which my publisher, Tryptic Press, and I feverishly plowed through production of, and it looks better than I could have imagined. So stay tuned and I’ll keep the Peanizles excitement comic your way!